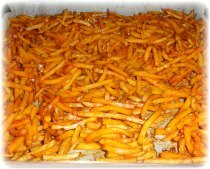 Our youngest boys help us every step in making these delicious no-fry fries, bake fries goodness. Making these fries is easy and faster than standing in line at the store to buy your frozen fries. These fries taste great and your whole family will be asking for seconds every time you make them. 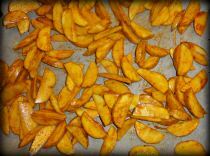 We have used this recipe for fries on potato wedges and 'silver dollar potato chips'. Our kids go wild over every variation we make, but their favorite is slicing the potatoes into round silver dollars. We always make a little extra to use as leftovers. This recipe needs a full baking sheet, feeds a growing family and is great with homemade chicken balls, chicken fingers, pizza or burgers. Take 10 minutes to make the fries and get them into the oven to cook 15 minutes both sides. Once you and your family have tried this recipe for fries you will never want to have store bought or take out fries again. Have fun making these potato wedges, 'silver dollar' rounds or string finger frenchfries with your kids. 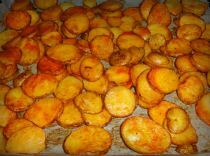 A few extra points to help with variations: use different potatoes, use extra virgin olive oil, try some different seasonings, slice up potatoes into big fries, wedges or circular silver dollars. While the potatoes are cooking make burgers, pizza, chicken fingers or whatever else you would like to have with your fries. This is filling for the whole family and they will love it. Enjoy!